American and their oneworld partner Qantas have joined together for a new sweepstakes that offers the winner a trip to Australia. (4) Click the submit button. All Entries must be submitted by the end date and time listed above. 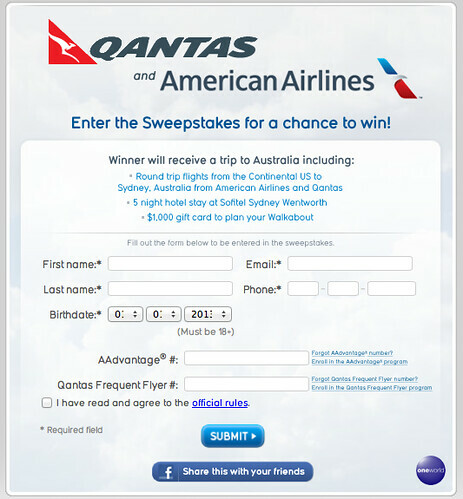 Limit 2 entries per person/Facebook Account, one for Qantas page and for American Airlines page..
All entries must be received by 11:59 p.m. EDT on June 24, 2013. Go here for the rules. Go here (American Airlines) and here (Qantas) to enter. @ Linda T – Here’s a direct link to the Qantas sweepstakes. Win a Trip to Western Australia“. That sweepstakes is exclusively for New Zealand residents. cannot be made from a computer, mechanical device, or electronic device at a place of business in the State of Georgia.